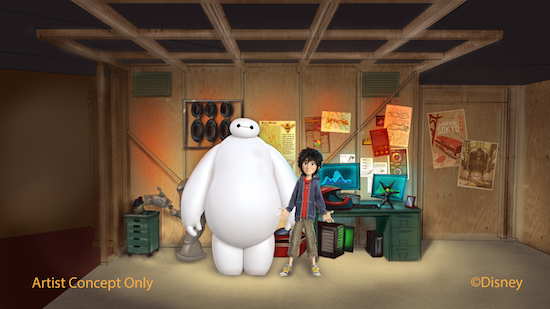 Concept art for the Big Hero 6 Meet and Greet have been released by Disney. Baymax and Hiro will be replacing Wreck-It Ralph and Vanellope at the Magic of Disney Animation in mid-November. Guests will be able to tour the lab at the San Fransokyo Institute of Technology and pay a visit to Hiro’s garage workshop.